From this process we acquire data that will reconstruct body motions (usually – but not always – excluding finger movements and facial expression changes, which are usually recorded separately and added later). 8 x 8 x (2.0 - 3.8) m - square for walking and running shots; the height of the volume is greatly extended at the centre to allow for jumping and so on. 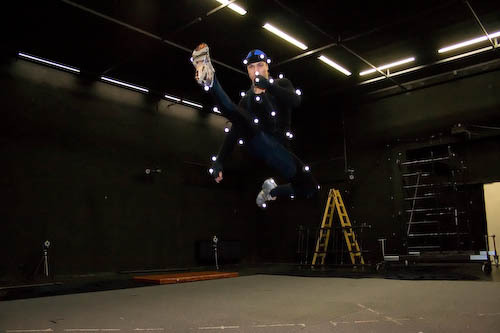 It is possible to focus more cameras on one area to create a “sweetspot” where things like facial MoCap are possible in the same shot. To reposition the cameras requires some time. To make it easier on and quicker for our clients we ask that they send the information on the movements they plan on recording in advance, this way we can prepare the cameras before they arrive. We can record multiple characters at once, interacting with each other. However, they occlude each other hiding certain markers - for better quality generic recommendation is to only record characters that are really needed for the shot and interact. There is no absolute limit, we recommend to record no more than about three to four performers at once for optimal data normally, may record more if needed (contact us, please, to discuss this). For listing of available props, please check separate page. The way it works is simple. We give the actor a special suit made from stretch cloth. Markers are then attached using velcro to the areas we want to capture. Using this suit is essential, it prevents the markers from moving, and thus makes our data more accurate. This system has been used countless times for many demanding projects, which has given us vast experience you can depend on.